Today I am going to discuss some of the Best food for Marathon Runners or long distance runners. These foods are important for long distance runners before the race and for recovery after the race. For those who are trying to lose weight through running it is extremely important to pay attention towards eating habits. In the last post on How to run a marathon I have discussed about the some of the important foods for runners. However in this post I am going to talk in details and will explain you the benefits of these food items particularly for long distance runners or marathon runners. Friends, I have been running for almost 10 years now. Over the years I have learned many things in the company of experienced runners. A perfect running is actually a combination of many things which I will tell you in next few lines. You cannot become a good runner just by running. To become a perfect runner you need to follow a strict routine. You need to exercise regularly. There are various exercises which are very good for runners. These exercises help in strengthening your muscles. Your life style is also very important. You should not indulge in bad habits such as smoking or drinking as such habits reduce your stamina. You should be very selective in your eating habits and should have a proper diet plan which we will discuss today. 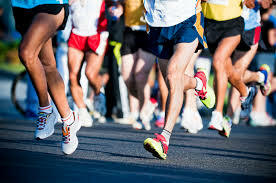 To become a long distance runner you should also have strong will power and patience which help you to run longer. And finally you should have a regular routine. I suggest that every week in the beginning itself you should plan you days and try to strictly follow the schedule. So that was a brief on how to become a perfect runner. Now I am coming back to core topic of today that is about Best food for Marathon Runners or long distance runners. I will start the article with the role of few important ingredients such as protein, carbohydrate and vitamins. Then I will first tell you what not to eat. Thereafter I will give you a list of important foods and benefits. It is important to understand why healthy food is important and why proper intake of protein, carbohydrate and vitamins is vital for runners. Carbohydrates are important because it play an important role in maintaining a healthy diet and fueling your runs. Carbohydrates are stored in your muscles as glycogen, which your body taps into during a workout. While carbohydrates are the body’s preferred source of fuel, protein also plays a very vital role as it provides energy and is important for muscle preservation needs of endurance athletes. Protein is mainly known for its role in the repair, maintenance, and growth of body tissues. After a long run recovery is very important and proteins help in it. Marathon runners should keep the protein intake to one gm per kg body weight. The foods which are full of proteins are non vegetarian foods, soya and paneer. Vitamins are important for our body in general. For runners they are even more important. Vitamin B complex helps in muscle recovery, vitamin E ensures joint flexibility and vitamin C boosts immunity and speed recovery. Calcium is important for making your bones stronger. Let us also discuss foods which we should strictly avoid if we want to become a better runner or we want to remain fit and lean. We should avoid food items such as fried foods, processed foods, sweets, refined sugar, caffeine, fizzy drinks, alcohol and oily foods. Runners should also strictly refrain from smoking as it will reduce your stamina. Some of us may think it is difficult to leave all such foods. But if you want to become a better runner and want to improve your stamina you should avoid such food. You can take them occasionally but do not take them on a regular basis. You should never skip breakfast. It should be consumed within an hour of waking up and should be containing all the essential nutrients our body requires. Take your dinner early and avoid eating after 8 pm so as to give your body enough time to digest. All of you must have heard the saying “Eat breakfast like a king, lunch like a prince, and dinner like a pauper”. This saying is very valid and we should try to follow it. I know it is difficult to be so strict in your food habits. But the purpose of this article is to make you aware how you can intake your food in a better and organized manner which most of us tend to ignore. Once we make effort to follow such routine we will realize the benefits which will encourage us to follow such practices. Also share and tell all this to your friends and family member so that everybody is aware about benefits of healthy food habits. After researching extensively I have found following foods which are very useful for runners. To make it simple I will tell you about the food items and its benefits. Bananas: Banana contains a healthy dose of potassium. For long distance runner it is a very important food. In long runs there are a lot of sweating which results in loss of stamina as well as loss of nutrients such as potassium and magnesium. Bananas naturally contain these nutrients. Therefore before the run, during the run and after the run, banana remains as one of the favorite foods for the long distance runners. Protein Rich Foods: I have told you benefits of proteins in the first part of my article. Protein helps in building, maintaining and repairing body tissues. It also increases the tyrosine level in the brain which keep one alert and energetic. Non vegetarian foods such as fish, chicken, mutton, eggs etc. are very good source of proteins. In case of vegetarians, soya, beans and dairy products will are good source of proteins. Fruits and Vegetables: Fruit and vegetables are a very good source of vitamins, minerals and potassium. They are dietary fiber rich foods which helps improving the digestion system. Please eat lots of green vegetables and fruits daily which will be very useful for your body. Oats: Oatmeal is a very good breakfast as it gives you a plenty of carbohydrates and it is also rich in fiber. You can take it in your breakfast. Peanut butter: Peanut butter is a good source of vitamin E. It contains a lot of fat but the good thing is that it mainly consists of monounsaturated and polyunsaturated fatty acids which can reduce cholesterol levels in your blood. Peanut butter is also good for strengthening your immune system. Peanut butter is also a good source of proteins and it helps in post run recovery after a long run. So in place of normal butter you should go for it as you can see it has many good ingredients which are helpful for a runner. Drink more fluids: Fluids are essential for a healthy body. Drink at least 8 glasses of water daily. Water keeps your muscles hydrated which helps in improvement in performance. Drinking water before your run also aids in keeping you healthy on the inside. Potatoes: Potato is a valuable source of potassium as well as of vitamin A. Like Banana it is very useful for a runner. Potato helps in improving your immune system and strengthening your bones. It is a rich source of calories.